Cork, 7 December 2015: Cork company Eirteic, The Service Assurance company, has won the Best Network Operation Initiative at the World Communications Awards. The winning project was for Eirteic’s implementation of a next generation service management platform for eir, the first phase of which went live earlier this year. 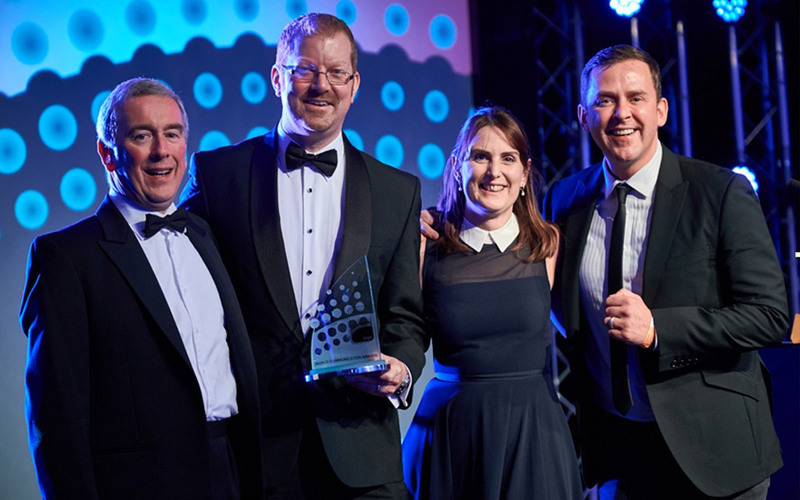 Eirteic is the first Irish company to win an award at the prestigious annual event, which was held in Wembley Stadium, London earlier this week. Eirteic had prestigious competition for the award with the shortlist consisting of AT&T, Vodafone, Epsilon and NetCracker. The WCA’s judging panel commended Eirteic’s well thought-out entry, which won full marks in the network management category. “The judges don’t often proclaim love for an entry, but one did here for the way it simplified network management,” said Tony Lavender, partner and CEO of Plum Consulting, who led the judging panel and presented the award at the ceremony. Eirteic proposed and delivered a solution based on the AssureNow platform from Monolith Software, the leading provider of technology management software for network operations centres. The project involved eir consolidating more than 70 diverse service management software tools across its fixed-line, mobile and IT network businesses into a single, unified platform on one site in Citywest, Dublin. Eirteic worked with eir to oversee the phasing out of the older technology which included products such as IBM Netcool, EMC Smarts, InfoVista, SolarWinds and BMC Patrol. Eirteic also deployed Galileo Vision, a customer experience visualization platform, as part of the solution. roll out live 4G maps, providing real-time status information for its mobile networks. Even before the award was announced, the project was praised by the outsourcing company Tech Mahindra. Delivery Director Deepak Maheshwari called eir’s new service management centre “one of the most integrated SMCs we have seen with our telco customers in all our international operations”. In addition, eir surpassed OpEx cost savings targets that had been identified in the original project plan. eir is the principal provider of fixed-line and mobile telecommunications services in Ireland with approximately 2 million customers. The company has the most extensive network in Ireland and provides a comprehensive range of advanced voice, data, broadband and ICT services to the residential, small business, enterprise and public sector markets. The Group is currently constructing Ireland’s largest fibre broadband network that will reach 1.9 million homes and businesses in the next five years. Launched in May 2013, the network now reaches 1.2 million homes and businesses and is the cornerstone of eir’s €2.5 billion strategic investment programme. 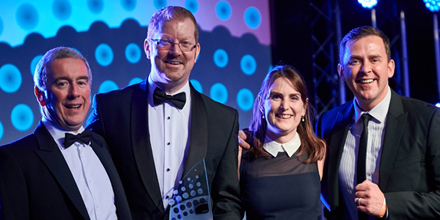 From left to right, Tony Lavender – CEO Plum Consulting, Eoin Geary – Account Director Eirteic, Sinead Burke – Head of Incident & Event Management |Networks – Open eir, Scott Mills – Awards Host.